Cerumen (the scientific word for ear wax) is your ears’ own cleaning solvent. It traps dirt and dust entering the ear canal, preventing it from slipping deeper down where it could get impacted and block your ear drum and dull your hearing. The ordinary daily mechanics of yawning, chewing and talking moves the dirty ear wax out of the ear canal so you don’t have to do anything except take a regular shower. Using a swab, fork, chopstick, finger, key, paintbrush or any other foreign object for ear wax removal will negate your ears’ self-cleaning efforts, pushing dirty old ear wax deeper into the canal where it can get impacted and cause hearing loss. Sure, cerumen may look worse than liver and onions, but your ceruminous and sebaceous glands make this special recipe for the health of your ears. Besides shoving dirt, dust and crud out of your ears, ear wax protects your ears against bacteria, fungal infections and viruses. Amazingly, it even repels insects! It also protects and lubricates the inside of the ear canal to keep it healthy. In fact, these glands whip up a special recipe of cholesterol, fatty acids, enzymes, alcohols, sebum, sloughed off skin cells, and other chemicals especially for your ears—the end result is ear-protecting ear wax. In fact, average cerumen is slightly acidic—which inhibits fungal and bacterial growth. 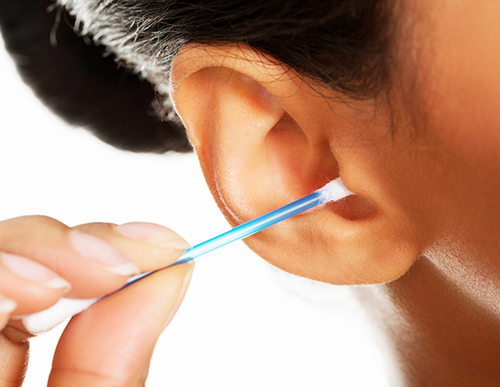 If you, like millions of other people, have a long-established ear cleaning habit with swabs, you may have jammed a bunch of old ear wax down into your ear canal, impacting it down there. This means you might have sustained some hearing loss. Schedule an appointment with your hearing care professional for a hearing checkup to determine whether or not you have impacted ear wax that might be causing some amount of hearing loss. Occasionally, people do have actual ear wax problems that need to be addressed with ear wax removal, but never with swabs. Some people’s ears make it too dry or too wet. Sometimes the chemical composition is off and it doesn’t do its job properly. Even in these cases, however, you should still shun sticking anything into your ears besides your elbow for ear wax removal or evaluation. Call your hearing care professional if you’re worried about your ear wax. Dear parents: ear cleaning and teeth brushing are not the same! Teeth don’t clean themselves, but ears really do! Every day, somewhere in America, 34 kids are rushed to the doctor with ear cleaning injuries. The sad thing is how it can harm kids’ hearing during important developmental years. So pass that sage advice from your grandma on to your children, because they often injure their own ears by sticking swabs into them. The most common of these injuries include tympanic membrane tears (torn ear drum) or other small lacerations and cuts inside of the ear canal. And for those of you asking about “ear candling”—don’t go there. It’s long been touted as a “natural ear wax removal” practice, but it’s one you should definitely avoid. Those who practice it stick a cone-shaped, hollow candle-like thing into their ear canals and set it on fire. Needless to say, thousands of people end up in the doctor’s office with ear candling injuries every year. If you shower daily and dab your ears dry with a towel, you should be good to go unless you have some other medical condition that affects your ear wax production and consistency. That should safely remove the ear wax your ear has already pushed out of the canal. If you really struggle with this ear wax advisory, or worry that there may be some ear wax impaction, hearing loss or injury to your ear, schedule an appointment with your hearing care professional right away.